The black jack table can host up to 9 players and is an easy to learn game you'll get the hang of in no time. this is an excellent choice if you have a smaller party or not much space to work with. The crazy race to 21 at the risk of going over. 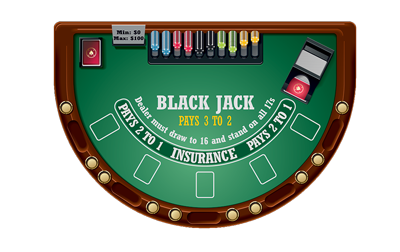 In Blackjack, the player wins if his hand has more points than the dealer, without going over 21. If either the player or dealer go over 21 it is called a break or bust and automatically loses. If both the player and dealer bust the player loses. If the player and dealer tie the bet is a push. Cards of rank 2 through 10 are scored according to their face value, with all face cards worth 10 points. Aces are semi-wild; meaning they can be worth either 1 or 11 points. A round of blackjack begins with each player placing a bet in the square directly in front of him/her. Then the dealer will give each player and himself two cards. Player cards are dealt face up. One dealer card is dealt face up (the up card) and the other face down (the hole card). Stand: If the player is satisfied with his hand as-is he may stand pat. To signify you wish to stand wave your hand as if to wave the dealer away. Hit: If the player wishes to take another card he may continue to do so until he either stands or busts. To signify you wish to hit tap the table with your finger. Double: If the player feels he needs one and only one more card then he may double his bet and be dealt one more card, good or bad. This option is only offered on the first two cards, and on the first two cards after splitting. To signify you wish to double place another wager next to your original wager of equal value. Split: If the player’s first two cards are of equal point value he may split them into two hands. In this event each card is the first card of a new hand. The player must also make another wager of equal value to the first for the second hand. The player may usually re-split up to 2 or 3 times if another splitting opportunity arises. Doubling after splitting is always allowed. To signify you wish to split put the additional wager next to the original wager. After all players have played their hands, from the dealer’s left to right, the dealer will play his hand. The dealer has no free will but must always play by certain house rules. The rule is that the dealer must hit until he reaches a score of 17 or more. If the dealer busts all players that did not bust automatically win. 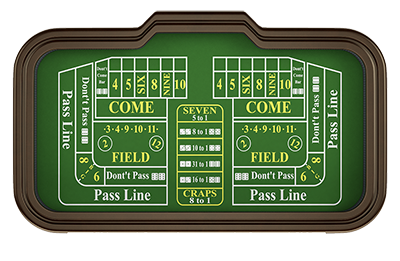 The craps table can host up to 16 players and is an excellent choice when you have more guests to accommodate. The game we all know so well with the "blow on the dice for good luck" and the shooting of dice to bounce off the opposite wall. Craps is played on a purpose-built table and two dice are used. The player must handle the dice with one hand only when throwing and the dice must hit the walls on the opposite end of the table. The craps table can accommodate up to about 20 players, who each get a round of throws or at ‘shooting’ the dice. If you don’t want to throw the dice, you can bet on the thrower. Several types of bets can be made on the table action. A new game in Craps begins with the Come Out roll. A Come Out roll can be made only when the previous shooter fails to make a winning roll, that is, fails to make the Point or seven out. Pass bets win when the come out roll is 7 or 11, while pass bets lose when the come out roll is 2, 3, or 12. Don’t bets lose when the come out roll is 7 or 11, and don’t bets win when the come out roll is 2 or 3. Don’t bets tie when the come out roll is 12 (2 in some places; the ‘Bar’ roll on the layout indicates which roll is treated as a tie). The poker table can host up to 9 players and is well enjoyed by the slightly more "seasoned" player. Know your hands (or our croupiers will help you), practice your best poker face and enjoy an evening of bluffing, winning or guessing. To start a new hand two ‘Blind’ bets are put up or ‘Posted.’ The player immediately to the left of the dealer puts up or ‘posts’ the small blind which is half the minimum bet. The player to the left of the small blind posts the big blind which is equal to the minimum bet. The rest of the players do not put up any money to start the hand. Because the deal rotates around the table, each player will eventually act as the big blind, small blind and dealer. Each player is dealt two cards face down with the player on the small blind receiving the first card and the player with the dealer button getting the last card. The first betting round begins with the player to the left of the big blind either ‘Calling’ the blind bet, ‘raising’ the big blind or folding his hand. 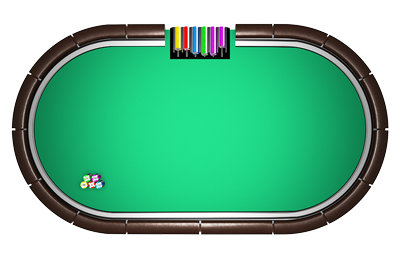 The betting goes around the table in order until it reaches the player who posted the small blind. By checking the player does not put in any more money. A rookie mistake sometimes occurs here. Because the blind is a live bet, the player with the big blind has already put his bet in. I have seen some players throw their cards in not realizing that they are already in the hand. Another rookie mistake is betting or folding your cards when it is not your turn. You must wait before you act. After the first betting round is completed, three cards are dealt and turned face up in the middle of the table. This is known as the ‘Flop.’ These are community cards used by all the players. Another betting round begins with the first active player to the left of the dealer button. When the betting round after the flop is completed, the dealer turns a fourth card face up in the middle of the table. This is referred to as the ‘Turn’, the minimum bet after the turn is now increased and begins again with the first active player to the left of the dealer. Following the betting round for the turn, the dealer will turn a fifth and final card face up. This is called the ‘river.’ and the final betting round begins with the same minimum bet. To determine the winner, the players may use any combination of their two hole cards and the five cards on the Table to form the highest five-card hand. In some rare cases the best hand will be the five cards on board. Don’t count on that happening too often. In that case the active players will split the pot. A sixth card is never used to break a tie. When the time comes to decide who gets the pot (showdown), there is a set of hand rankings that is almost universally accepted to determine who wins. If two or more hands are of the same ranking, the winner is the one having the higher images/cards. For example, a Flush with an Ace high beats a Flush with a King high. If the hands are still tied, then it is the highest card not being held in common (the kicker) that determines the winner. In the event of hands being absolutely identical in ranking, the pot will be split evenly between the two or more winning players. If there is an odd chip, the winning player to the left of the button/dealer will receive it. The roulette table can host up to 9 players and is a real crowd entertainer. This is a game of odds, numbers and is a very spontaneous game, great for larger groups of people. A U.S. roulette wheel consists of 38 numbered slots: numbers 1 to 36, a zero, and a double zero. The betting layout consists of every individual number as well as a host of “outside” or combinations of numbers. After the players make their bets the dealer spins the wheel and a ball and after several seconds the ball will land in one of the numbered slots. The following table displays the available bets and the payoff.